The titan arum is better known as the corpse flower or corpse plant. The reason for this is because of its unique and pungent aroma. The unusual fragrance makes it an uncommon addition to gardens. Aside from the fragrance, many appreciate its striking bloom style. The large and vivid bloom can make a stunning focal point in a garden. However, it requires special care and patience in order to bloom. 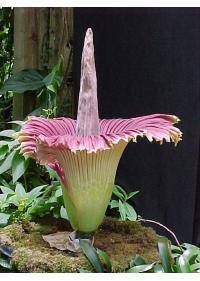 Amorphophallus titanum is an easy bloom to locate in a garden. It grows quite tall, often up to ten feet once it reaches maturity. It also can become very heavy, as some can reach 200 pounds. Because of its size, it is not practical for small gardens or homes. This is why many grow titan arum seeds in a private botanical garden. Other large areas may also be used when attempting to grow them. Those looking to grow it should first know the titan arum facts. Typically, only advanced gardeners can grow this type of plant. This is due not only to the size, but also to the required time. It can take years of careful cultivation for a chance at a bloom. The first thing to understand is the titan arum life cycle. It has a long growing period, as well as long dormant phases. It can often go many years without producing a single bloom. Because of the long grow cycle, it is not for the average gardener. Those who do not grow it, often will travel to botanical gardens. These are often the best place to see it when it finally blooms. The bloom typically lasts only one to two days at the most. The short nature of it makes the timing very important for some. It is often considered a once in a lifetime event for many. Those attempting to grow from titan arum seeds must be patient. Some may find that it takes trial and error in order for it to grow. This may mean starting several plants at a time for some gardeners. Moist and shady conditions are important when growing from seed. It is recommended to grow them in a greenhouse for better results. Greenhouses are essential for creating the best possible climate. Special titan arum adaptations give it a unique appearance. Some of the adaptations include male and female bloom positioning. However, this positioning prevents it from self pollinating. The lack of self pollination makes it more difficult to get blooms. In the wild, the insects that it attracts help to pollinate plants. In a greenhouse, the pollination may be more difficult to achieve. The rarity of the flowers makes them impractical for a bouquet. They are too large, and blooms quickly fade once they emerge. They are also seldom given as a potted plant gift due to the size. Many consider them to be an unlucky flower because of the smell. However, they are often used in paintings or other art displays. This is typically owed to their unique and striking appearance. The associated fragrance also gives it some symbolism with decay. Some choose to ignore this and instead see it as a symbol of long life. This is because many plants can live as long as 40 to 75 years.